In New Line Cinema's “Lights Out,” a tale of an unknown terror that lurks in the dark. Right after watching "Lights Out" I think I have to sleep with the lights on tonight. The film has this eerie overall feel that connects to the natural human impulse of being scared of the dark. What we love about this film is that it offered a simple yet effective way of playing with the emotions of the audience by just giving a small glimpse of what truly is doing the heartless killongs in the film. What we don't see and fully understand truly makes us more uncomfortable and worried. A very ontimate number of cast, well developed in the film was truly helpful. It gave the film a very close relationship to the audience. Several times the cinema audience was even screaming and creating noise before the characters in the film. Produced by master of horror, James Wan, “Lights Out” opens in Philippine cinemas Thursday, July 21. 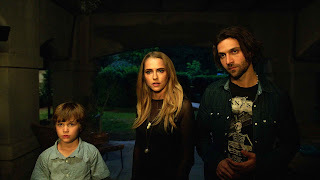 When Rebecca (Teresa Palmer) left home, she thought she left her childhood fears behind. Growing up, she was never really sure of what was and wasn’t real when the lights went out…and now her little brother, Martin, is experiencing the same unexplained and terrifying events that had once tested her sanity and threatened her safety. A frightening entity with a mysterious attachment to their mother, Sophie (Maria Bello), has re-emerged. But this time, as Rebecca gets closer to unlocking the truth, there is no denying that all their lives are in danger…once the lights go out. Opening across the Philippines on Thursday, July 21, “Lights Out” is distributed in the Philippines by Warner Bros. Pictures, a Warner Bros. Entertainment Company.